Over the past couple of years, I’ve written about an innovative an small UK based biotech firm, Oxitec, which has developed genetically modified mosquitos (always males), sometimes referred to as Frankensquitoes, that would mate with wild females. By the way, I fully embrace the term “Frankensquitoes,” although it’s not really how these mosquitoes are modified. After mating with the genetically modified males, the females would produce offspring that cannot survive to adults. The males have a gene, which passes to the next generation, that cause them to require require an antibiotic, tetracycline, in their diet to survive. Tetracycline is not a compound that is found in nature, like the blood of mammals that are the food source for these mosquitoes. Over time, with multiple releases of males, the population of the Aedes aegypti mosquito, which is one of two vectors (along with Ae. albopictus) for transmitting Zika virus to humans, would fall. Eventually, the population of the mosquito would be reduced to a level where transmission of the virus would be slowed or stopped. Of course, there would be other benefits for eliminating this mosquito. Since Ae. aegypti is also the vector for other serious tropical diseases, such as the aforementioned Dengue fever and Chikungunya, there could be added benefit to eliminating the mosquito. 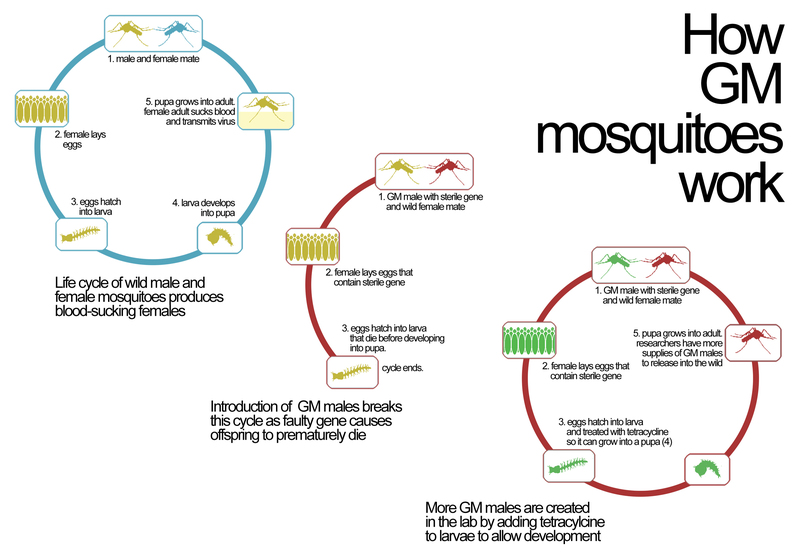 Lifecycle of genetically modified mosquitos. Zika virus was first isolated in 1947, when scientists discovered it in the Zika forest of Uganda. The Zika virus is related to the dengue, yellow fever, Japanese encephalitis, and West Nile viruses, all dangerous diseases. It only recently emerged as a broad threat to human health, when the virus appeared in Brazil in 2015. Since early 2015, Zika has spread rapidly through the Americas and active transmission is now present in over thirty countries and territories. If the virus passes from the mother to a fetus, it can cause microcephaly, a condition where a baby has a smaller than typical head and brain. It also can cause neurological disorders such as Guillain-Barré syndrome, an autoimmune disease that can attack the nerves. According to the CDC, many people infected with Zika do not exhibit symptoms, or may have symptoms so minor that they are often confused with other, milder infections. Thus, many infected individuals may not know that they have the virus. Symptoms include fever, skin rashes, conjunctivitis, muscle and joint pain, and headache. In 2015 an outbreak was reported in Brazil. On 1 February 2016, the World Health Organization (WHO) issued a “Public Health Emergency of International Concern,” given the epidemiological link between Zika virus infections and babies born with neurological syndromes. The causal link between Zika and neurological disorders in newborn babies was confirmed by the CDC. Most important, these genetically modified mosquitoes allow mosquito control districts to avoid or reduce the use of insecticides which have significant more risks to the environment and humans than any imagined beliefs about genetically modified mosquitoes. Additionally, insecticides may have unintended consequences by harming other species of insects that may provide a benefit to the environment. Frankensquitoes only hurt one species of mosquito. Because the modified mosquito only lives one generation, about 2-4 weeks. The Frankensquitoes and the next generation will perish, because of the lack of the tetracycline nutrient. Insecticides can last for much longer periods of time. The other method of reducing mosquito populations is the “sterile insect technique” (SIT). This method relies upon radiation-sterilize males, which are then released into infested areas to mate. Unfortunately, the radiation weakens the male, so that they don’t mate in numbers sufficient to eliminate the mosquito population. Just last week (6 August 2016), the FDA has found that the GMO mosquito will have no significant impact on humans or the environment (pdf). Oxitec will probably seek approval from Florida to proceed with the release of the mosquitoes in parts of the Florida Keys. But of course, after several years of testing, the crazy internet still is opposed to the release of these Frankensquitoes. During the comment phase of the FDA decision mentioned above, there were complaints flooding the FDA from “concerned citizens” that may have caused a delay in a decision on release of these mosquitoes. One of those useless slacktivist petitions on Change.org is pushing pseudoscience and outright misinformation about the genetically modified mosquito. Sadly, it has just under 170,000 signatures, which means absolutely nothing to anybody. But let’s remember that 170,000 people must think junk science is more important than saving human lives. I don’t get it. What about the native species of Florida Keys Bats. Are there any studies being conducted to see if these mosquitoes will harm the native bat population? The bats are not particular about the species of mosquito they eat. If A. aegypti is eliminated by this method, it’ll be replaced by other, less dangerous species, which will be just as tasty to those bats. And the genetically modified mosquitoes will also be tasty. It’s not going to be a problem. Speaking about Florida Keys Bats, lets get more, they’ll eat all the mosquitos. No they won’t. It’s some sort of fantasy to believe that you could fill the environment with a predator, and eliminate all the prey. If they did that, the predators would all die. And besides, bats in the numbers necessary to remove every mosquito has its own health and environmental issues. That mosquito DNA is going to get injected into humans with unknown consequences. It’s nearly impossible to take this type of claim seriously. If this were possible, we’d have become mosquitoes millions of years ago. Or corn stalks. Or beef cattle. Or just about anything else. Foreign DNA cannot be immediately incorporated into the human genome, unless you’re inventing some new kind of science. A foreign DNA particle injected into the bloodstream by a mosquito would not be immediate incorporated into the human genome, spread through every cell, immediately killing us. No, the immune system would identify the particle as foreign and eliminate it. That mosquito DNA is going to get injected into humans with unknown consequences. Part 2. Male mosquitoes, the only ones genetically modified, don’t bite. They only like flower nectar. Even if you believed that genes magically pass from the mosquito to humans, it would never happen because you’d never get bitten. The bioengineered genes would pass to the bats. Precisely how is this claim biologically plausible? See above. The DNA/RNA within food sources do not get transferred to the consuming species. It’s biologically impossible, and betrays a high degree of biological ignorance for anyone who states that. But, as you know, when anyone starts discussing how genetic engineering can actually help our lives, science gets set aside and politics matters more. Activists, using the same techniques as all science deniers, whether creationists or global warming deniers, try to create a debate that sounds scientific, but never really is. The fact is that molecular genetic engineering is more precise and predictable than older, cruder techniques like irradiation, for mosquitos. Ironically, the SIT method, using radiation, is mostly unregulated with little or no science that supports the safety and effectiveness of SIT. On the other hand, the regulatory reviews of genetically engineered living organisms have tended to be drawn out and excessively cumbersome throughout the world, with political debate delaying or preventing approvals. As a consequence, lifesaving technology, like the genetically modified mosquitoes, becomes more expensive, and possibly may never be employed to protect human health. In other words, quit delaying technology that can help mankind because of an oversensitivity to political debates that can be largely dismissed by real science. There are no convincing arguments, at least from a scientific point of view, that genetically modified mosquitoes pose any danger to humans, other animals, plant life, the environment, anything. This is based on science, not pseudoscience and junk science. We have mountains of scientific evidence that support the fact that mosquito-borne illnesses, like Zika virus and Dengue fever, harm and kill human beings. Those are unassailable facts. We have boatloads of scientific evidence that these Frankensquitos can save lives by substantially reducing the numbers of disease-carrying mosquitos. Those are also unassailable facts. Regulators, either at the state or Federal level, have got to stand up for real science and firmly reject the ridiculous populist rhetoric that attempts to create pseudoscientific roadblocks to progress. These mosquito borne diseases harm humans, and we have a rather elegant and safe solution to prevent the spread of the disease. The elitist anti-biotechnology crowd seems to have one goal in mind – block anything that doesn’t support their narrow-minded view of the planet. They employ some Naturalistic Fallacy, or an Appeal to Nature, that the only right way to help humanity shouldn’t include biotechnology, because it’s not natural. That kind of arrogance could kill us all. In a short period of time, we will also have a vaccine for Zika virus. I’m sure that will start a whole new set of ridiculous pseudoscience. I better get prepared. For now, we have a way to prevent Zika virus – let’s use it quickly. Centers for Disease Control and Prevention (CDC). Dengue hemorrhagic fever–U.S.-Mexico border, 2005. MMWR Morb Mortal Wkly Rep. 2007 Aug 10;56(31):785-9. Erratum in: MMWR Morb Mortal Wkly Rep. 2007 Aug 17;56(32):822. PubMed PMID: 17687243. Chakradhar S. Buzzkill: Regulatory uncertainty plagues rollout of genetically modified mosquitoes. Nat Med. 2015 May 7;21(5):416-8. doi: 10.1038/nm0515-416. PubMed PMID: 25951523. Racloz V, Ramsey R, Tong S, Hu W. Surveillance of dengue fever virus: a review of epidemiological models and early warning systems. PLoS Negl Trop Dis. 2012;6(5):e1648. doi: 10.1371/journal.pntd.0001648. Epub 2012 May 22. Review. PubMed PMID: 22629476; PubMed Central PMCID: PMC3358322. Impact factor: 4.569. Radke EG, Gregory CJ, Kintziger KW, Sauber-Schatz EK, Hunsperger EA, Gallagher GR, Barber JM, Biggerstaff BJ, Stanek DR, Tomashek KM, Blackmore CG. Dengue outbreak in Key West, Florida, USA, 2009. Emerg Infect Dis. 2012 Jan;18(1):135-7. doi: 10.3201/eid1801.110130. PubMed PMID: 22257471; PubMed Central PMCID: PMC3310087. Impact factor: 5.993. Sikka V, Chattu VK, Popli RK, Galwankar SC, Kelkar D, Sawicki SG, Stawicki SP, Papadimos TJ. The Emergence of Zika Virus as a Global Health Security Threat: A Review and a Consensus Statement of the INDUSEM Joint working Group (JWG). J Glob Infect Dis. 2016 Jan-Mar;8(1):3-15. doi: 10.4103/0974-777X.176140. PubMed PMID: 27013839; PubMed Central PMCID: PMC4785754.